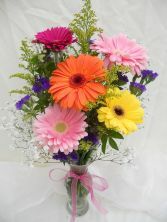 Show that special someone you are crazy for them with everybody's favorite, gerbera daisies! 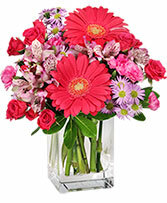 Mixed with bright colorful fillers,gerbera daisies and greenery in a flared glass vase. 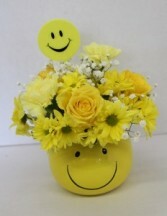 Sure to be a hit! 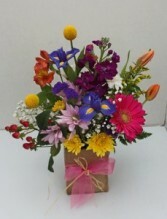 A beautiful long lasting garden looked arranged in a glass rectangular vase covered in burlap.